A Galleon PC Atomic Clock ensuring your PC always has the correct time. 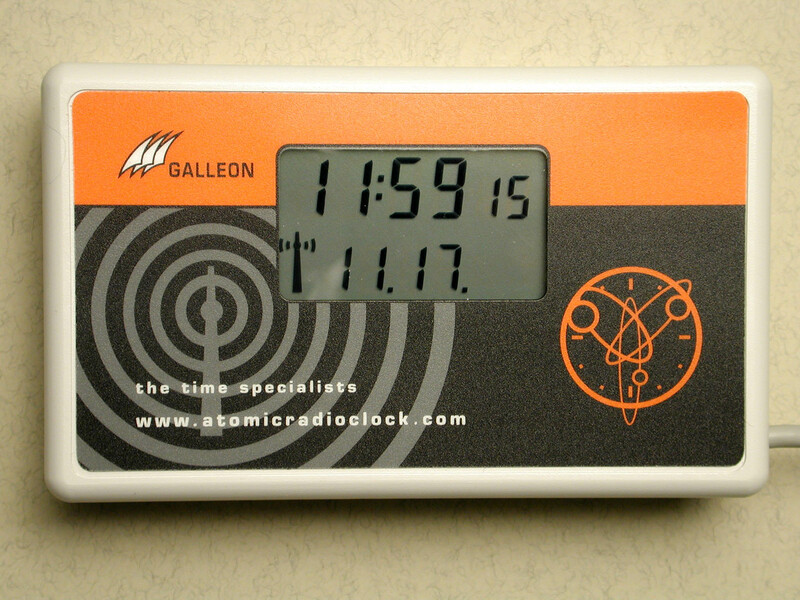 A Galleon PC atomic Clock is a radio time code receiver. It is available as 3 versions to receive either the MSF (Rugby, UK), DCF(Frankfurt, Germany), or WWVB (Colorado USA) radio time signals. The antenna enclosure is rated for indoor use only up to 10m from the hostcomputer. It is also constantly checking the correct time against a radio signal direct from the National Time standard clock in Rugby. Soyour computers are synchronised to precisely the correct time. The unit is cost-effective, yet highly reliable. The Software that comes with the WorkstationARC will synchronise a single PC to the radio time signal MSF as is transmitted fromRugby by NPL. The software runs as an application. All diffrent types of organizations all over the world (in such places as America, Europe, Australia, and the Middle East) are alreadyusing Galleon Atomic Radio Clocks; we have synchronised time across the globe for organizations as diverse as GlaxoSmithKline to BuckinghamPalace. Other customers include Daimler Chrylser, 3M, NASDAQ, Kellogg's, Sharp and Shell. Atomic Radio Controlled Computer Clock battery powered with serial interface, time, signal strength and date display. Software driverfor Windows 2000/2003/XP/NT/ME/95/98, runs as an application.